Tenderly cradling her missing daughter's favourite doll, Irene Suarez sobs a touching message to Kate McCann: "Keep strong, don't give up." Irene, 34, whose daughter Mari Luz Cortes vanished last Sunday, truly understands the agony Kate is going through. They are two mothers united in despair and clinging to hope. In heartfelt words, Irene pleaded to Kate: "Don't give up, Mrs McCann. Use all your strength to carry on. Don't give up. I believe Madeleine will be found." Before Irene and Kate's lives were shaken to the core, you would have thought them worlds apart - the Spanish street seller from a gypsy family and the affluent, middle-class British doctor. But Kate was sickened when news reached her that Mari had vanished from a town just 90 minutes from the resort where Madeleine disappeared more than eight months ago. Could the maniac who abducted her four-year-old daughter have struck again? That terrifying prospect has loomed over the Spanish south-west border town of Huelva as hundreds searched for Mari. And Irene knows she and Kate must stick together. She said: "When it came out on television about Madeleine last summer I felt very deeply moved, it struck my soul. "With the speculation that Mrs McCann could be guilty of killing her child, I said that's all lies. For a mother to do that is unthinkable, impossible." Wiping tears from her cheek, Irene adde "From my heart I hope I can give her hope and strength." Within hours of Mari vanishing, Kate, 39, sent a message to Irene and her family. She wrote: "I feel your pain, my thoughts are with you."" Five-year-old Mari disappeared after buying a packet of crisps from a kiosk 100 yards from her home. There are few clues - and as the days roll by, distraught Irene and dad Juan Jose Cortes fear the worst. For all the differences in their backgrounds, the lives of Irene and Kate, of Rothley, Leics, now bear striking parallels. Both have attractive daughters of a similar age who just vanished - seemingly without trace. They believe their daughters have been abducted. And both have prompted a huge response, mobilising supporters and relatives to give out pictures of their children. For Mari, like Madeleine, every inch of coastline and wasteland has been scoured. Helicopters and sniffer dogs were brought in. But as days go by, hope begins to fade. Both mums have wept before the world as a news story unfolds to tug at millions of hearts. Inside flat 2A, a modest three-bedroom apartment, Irene sobbed uncontrollably. Juan, also 34, an ex-professional football player turned builder, leaned in and held her. Irene then led me into Mari's tiny bedroom filled with toys, dolls and teddy bears. She sat on the bed - a Snow White duvet cover beneath - and clutched the girl's doll, called Maria, with both hands. She wept to Mari: "Don't cry my baby. Try to be strong. Mummy is waiting for you."" Irene told me: "Mari Luz is pretty. She loves to dress up and wear makeup. She loves to swim. She is a lively girl." Within days of her going missing, Irene released a video of the girl dancing flamenco and opening her Christmas presents. Behind Irene was a heartbreaking note in felt-tip pen on a noticeboard, next to magnetic letters spelling "Mari Luz". Mari's brother Daniel, 10, had written: "Come home soon, I love you, I cannot live without you, I need you and you are what I want more, you are my little star and I will never forget you, because without you my life is full of pain." In Madeleine's home, twins Sean and Amelie approach their third birthday without a big sister. They were asleep when she was snatched from a holiday flat in Praia da Luz on May 3. Irene and Kate both appealed for their girls’ safe return within hours of them disappearing. Moments before one TV plea, Irene collapsed. 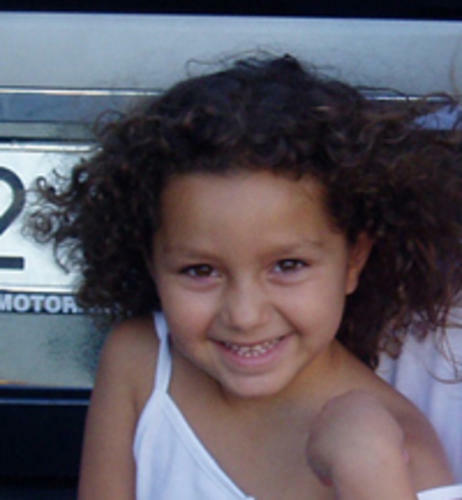 Then, at a march through Huelva by 2,000 people for Mari, she almost fainted and had to be taken home. Kate also struggled after losing Madeleine. Her weight plummeted, she looked tired and gaunt, and friends say she is depressed. Her seeming equilibrium – for which she was both praised and disparaged – was shot to pieces. She could not give interviews and sobbed uncontrollably on Spanish TV. Both mothers have been torn up by sneering comments accusing them of not doing enough to protect their children. And Kate has even been named a suspect by police. Mari, who also brother Juan Jose Jnr, 14, left home around 5pm last Sunday. Irene recalled: “We came from the market, where we were selling. We ate. She got her stool out and helped clear the table. The mums are both religious. Kate is a devout Catholic and gave confession to a priest in Portugal, while Irene is an evangelical Christian who prays daily. 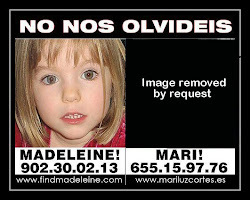 As well as advice and support, Kate has offered to include Mari’s photo on 12,000 “Find Madeleine” posters about to be printed and pinned up around Spain. Both women are united by one passionate, desperate cause – to find their beautiful daughters alive and well.